First couple of days of our family two weeks holiday to Coylumbridge – had been allowed some days to walk some of the Cairngorms. This is the first. Parked at the Cairngorms car park and initially headed up the tourist path before branching off towards Fiacaill between Coire an t-Sneachda and Coire an Lochain. Initially clear but was soon in the clag and mist over the top and then down Coire Raibert alongside the stream. On a previous walk up Ben Macdui, I’d hoped to return via Loch Avon but had to divert due to weather. It’s an area I’ve always wanted to visit and was looking forward to it. First glimpse of Loch Avon; despite the poor weather I was struck by the natural beauty of the place. Branched off SW before the bottom to skirt round the west end of Loch Avon, over the stepping stones where I passed some wild campers. Ideal place to camp with some good shelter and water supply. Then followed the track southwards towards Loch Etchachan heading initially towards Ben Macdui but branched off southerly towards Derry Cairngorm and my first summit of the day. Views all round of the surrounding Cairngorms. Tracked back towards Loch Etchachan and met a walker on his way up from Lairigh an Laoigh. Stoppped for food then up the winding track to Beinn Mheadhoin. Past the tors to the top. Summit cairn on top of a tor. I then wanted to go down to Beinn Bhreac so went SW from the summit and steeply down to the Lairigh an Laoigh. Steep but heathery and grassy so not too bad. Crossed over and then uphill to get to the plateau between Beinn a’ Chaorainn and Beinn Bhreac. Met a large party of walkers on their way down from Beinn a’ Chaorainn. Beinn Bhreac seemed rather far away – lots of bogs and peat hags to go through before getting to the summit. Suspect it may have been better going further east first and then down the centre of the plateau. Got to Beinn Bhreac’s main summit. Then walked back northerly via Beinn Bhreac’s west top. More towards the east of the plateau now, headed north and then east towards Beinn a’ Bhuird. Still boggy but managed to find a track for part of the way which helped. Up to Beinn A’ Bhuird’s north top. Now getting late in the day, weather windy with clag coming down so wanted to find some shelter – not very easy up here. Thankfully had previously topped up with water in one of the burns as there wasn’t any up top. Found a large rock between the north top and Cnap a’ Chleirich and set up the tent beside it for shelter. Not too bad a night but woke to almost no visibility at all due to clag and mist. Tent very wet. Had breakfast and then set off towards Ben Avon leaving the tent up hoping it would dry a bit. Gaining height towards Ben Avon, I started to get above the cloud and mist – nice views opening up all round. Headed towards the summit of Leabaidh an Damh Buidhe (Ben Avon) which was becoming clearer by the minute. Clambered up on to each of the two highest summit tors as I wasn’t sure which was the true summit. Good excuse on such a lovely morning. Took quite a few photos before heading back into the clag towards the tent. Got a very faint brocken spectre on the way – didn’t come out too well on the camera though. Packed up the tent and set off back to Beinn a’ Bhuird, down to the plateau and up to Beinn a’ Chaorainn where I met two walkers who had come up from Derry Lodge – long chat (think I was getting lonely). If I’d had more time, I could’ve added on Creag Mhor but I was getting tired by this time with a fair way still to go. Set off NW down Beinn a’ Chaorainn towards the Lairigh an Laoigh. On the way down I could make out a track winding its way up the east side of Bynack More and decided to try that way rather than going round to its south flank. Got to the stepping stones and the River Avon. It was too deep to walk over by the stones so, boots/socks off, wetsuit shoes (better grips than my flip-flops) on, walking poles out and crossed over to the Fords of Avon refuge. From there, walked NW towards Bynack More and picked up the track which rose gradually up the hillside. The track disappeared in places but wasn’t long before I was up close to the Barns of Bynack. Then up to the summit of Bynack More - final summit for this trip. Then began the long walk out. SW from the summit to The Saddle and then the steep rise up a rather wet track to the top. Nice views of Loch Avon en route. Still some snow in the corrie. Over the top and down past the Ptarmigan restaurant and back to the car. The weather had held up and was certainly a lot better on day 2. Found the final walk out hard especially due to the climb back up towards Cairngorm – but loved the whole area in and around Loch Avon. Was on Cairn Gorm the following day and the weather was still great. Sadly I didn't take a very interesting route though. Ive still to do most of the Ciarngorms. Rockhopper you're mental! Great job on both of these long distance trips, what a way to smash out the Gorms. Splendid stuff - you really saw the majesty of Ben Avon, with those shots. Brilliant Rockhopper, the photos above the cloud are superb as are the ones on the second day. Good effort on what looked quite a hard couple of days. 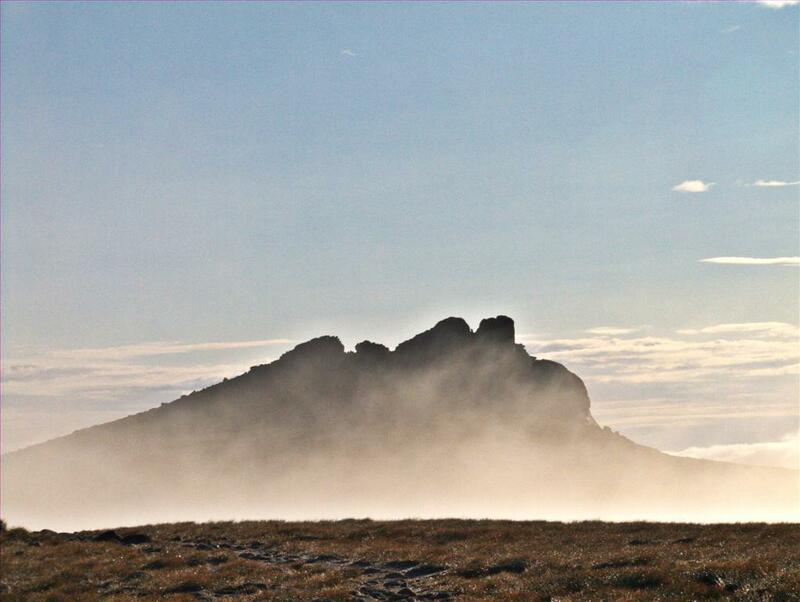 Wow what an absolute epic walk, superb photo's that really do make the area look stunning! Love the photos, they are stunning. We walked Bynack More yesterday - starting off in hot sunshine and ending up in wind, cloud and rain - but really enjoyed it none the less, enjoyed looking at your summit pics as our view was somewhat limited! We visited the Barns - didn't realise there are more on the other surrounding hills. Superb Rockhopper, cracking 2 trips on the Gorms hopfully get to return early September myself to finish them off, loved the report and pics well done. I am beginning to have my doubts about your sanity Rockhopper what an incredible two days, I love the 'rolling hills' appearance of this area but wouldn't think of trying to tackle it in two days!! Glad I noticed this report - I'd been looking at maps this past weekend planning a similar amble, albeit less ambitious. This certainly helps and stokes the enthusiasm. Brilliant pics by the way - 26 especially.